A dental implant is a form of dentistry used to replace missing teeth for a look and feel that is natural. They are surgically placed below the gums over a series of appointments. The procedure involves attaching the implants to the jawbone and gum tissue to become a stable base for one or more custom artificial replacement teeth, called dental crowns. Candidates for dental implants need to have healthy gums and adequate bone to support a secure implant. Dental implants are frequently the best treatment option for replacing missing teeth because unlike dentures that rest on the gumline or the use of adjacent teeth as anchors, dental implants are long-term replacements that your local dentist can provide. Dental implants are amongst some of the most successful procedures in dentistry. Existing Medical Conditions- If you currently have routine dental treatment, you can generally have an implant placed. Your doctor will let you know if you have a certain condition in which an implant would not be appropriate. Patients with chronic diseases such as high blood pressure and diabetes are usually successful candidates for dental implant treatment. Implants are designed to be a permanent dental restoration. Of patients who were missing all of their teeth, long-term studies (more than 30 years) show an 80 to 90 percent success rate. For patients missing one or several teeth, six-year studies show a success rate of greater than 90 percent, which compares favorably with other areas of the body that receive implant replacement (such as hips or knees). Dental implants provide patients with a whole range of long-term health benefits. Patients with dental implants enjoy restored function to the bite, improved speech, and chewing ability. Dental implants also help prevent damage to surrounding teeth, additional tooth loss, and bone recession. When left untreated, missing teeth can cause the jaw to lose structural stability and may begin to recede leaving the patient to appear older than they are. According to the American Dental Association (ADA), more than 20 million people in the United States are missing all of their natural teeth. And, more than 100 million are missing as many as 11 to 15 teeth. Dental implants are designed to provide a stable foundation for the replacement of missing teeth. 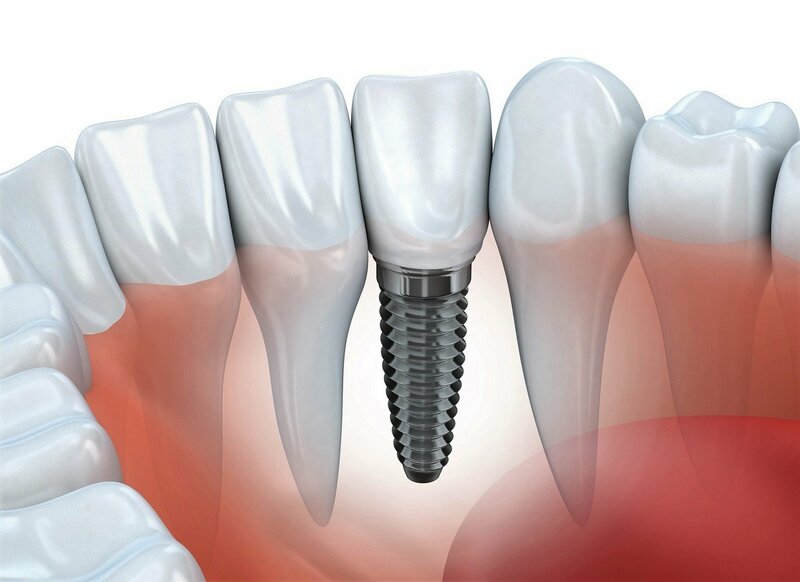 Dental implants are tiny titanium anchors that are designed to act as implant tooth root substitutes. They are surgically placed into the jawbone. Once healed, the implant will be fused with the jaw bone for a long lasting and stable foundation. Small posts, called abutments, are then attached to the implants. These protrude through the gums, allowing a conventional crown to be attached to the implant. Dental implants provide stable anchors for artificial replacement teeth. Dental implants are ideally placed directly into the site of the missing tooth. Placing an implant in the extraction socket gives us the greatest potential to reclaim the natural esthetics of that tooth while ensuring the best stability of the jaw bone. The placement of an implant in the exact position of the tooth allows for predictable and natural looking results. In most cases, the dental implant procedure involves at least two visits to our Kennesaw, GA dentist office. First, the implants are placed in your jawbone. For the first three to six months following surgery, the implants will heal beneath the surface of the gums gradually bonding with the jawbone. While your implants are healing or integrating we will work with you to custom design and fabricate your permanent dental restoration. The final restoration is made from the most modern dental materials for natural and durable results. Ceramic restorations provide natural aesthetics that will blend seamlessly with your natural smile. The entire procedure usually takes six to eight months. Most patients do not experience any disruption in their daily life.